A one-day Sally Ride EarthKAM workshop was conducted at KR Mangalam World School, Chi II, Greater Noida on September 27, 2017. Sally Ride EarthKAM is a NASA sponsored project. EarthKAM means Earth Knowledge Acquired by Middle School Students. It is an educational program that enables students to take pictures of their own planet from a digital camera on board the International Space Station (ISS) via a web interface. The EarthKAM camera is till date a permanent payload on board the ISS and supports approximately four missions annually, one for each season. The recent mission was opened from September 24, 2017 to September 28, 2017. 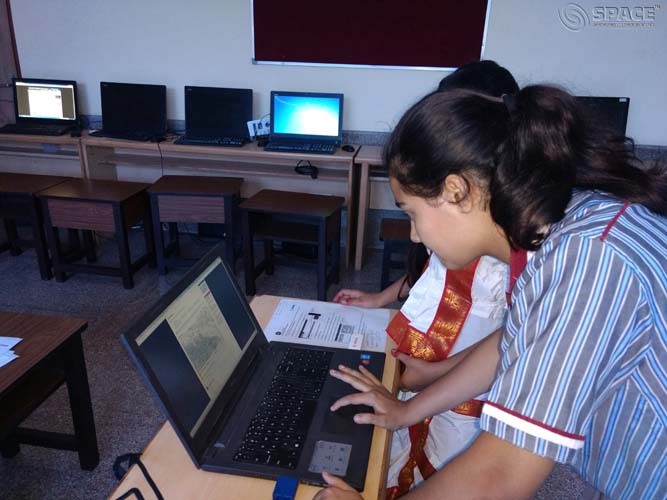 The workshop took place in the computer lab of the school from 11:00 a.m. – 12:15 p.m. 11 students from Classes VI-VIII participated in this workshop. Students were briefed about the ISS EarthKAM. After which the students used the EarthKAM interface to request their images. The workshop started with a presentation on Sally Ride EarthKAM and how the program works with a brief demonstration showing the students how to request for the photographs keeping various aspects such as orbital path, weather, location, day/night preference in mind. After which the students had an hour of exciting time of locating regions of their interest and requesting for photographs after examining weather, orbits and other aspects. The workshop ended with the students writing.